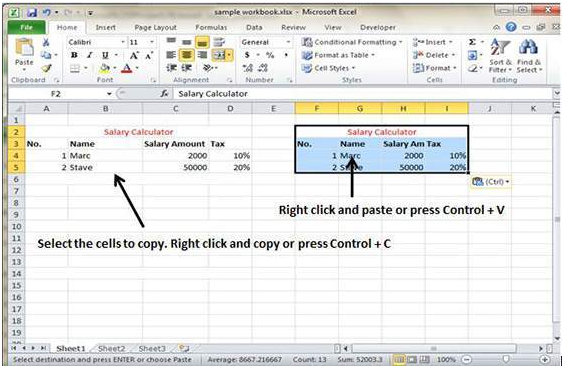 MS Excel allows user to copy paste in various different ways. • First, select the cell you want to copy. Then, choose copy option after giving a right click by simply pressing Control + C.
• Now select the cell where you want to past the copies content. Simply give a right click and select paste option or press keys Control + V.
Whenever you copy data in the worksheet, the copied content is placed in Windows and Office Cupboard. Clipboard content can be viewed by going to the Home and selecting Clipboard. 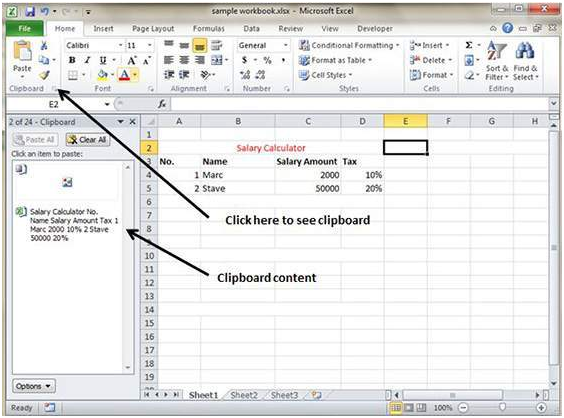 Now, it will view the clipboard content and select the cell the where you want to paste it by giving a click on paste. 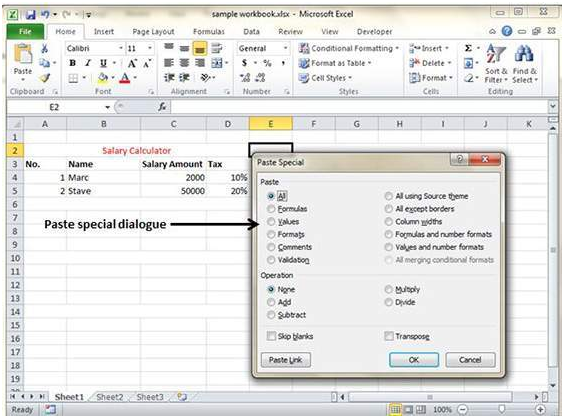 Sometimes users require to copy only values or only the formatting of the cells, then select the paste special option. Here are various options found in Paste Special. • All – It pastes the cell’s contents, data validation and formats from the Windows Clipboard. • Formulas – It pastes the formulas not formatting. • Values – It pastes the values not formulas. • Formats – It pastes only the formatting of the source range. • Comments – It pastes the comments with their respective cell. • All using source theme – It pastes formulas along with all formatting. • Validation – It pastes the validation applied in the cells. • Column width – It pastes the formulas and even duplicated the column width of the copied cells. • Values & Number Formats – It pastes the results of formulas along with numbers. • All except borders – It pastes everything in the source range except for the borders. • Formulas & Number Formats – It pastes formulas and number formatting only. • Merge Conditional Formatting – It merges the conditional formatting with any conditional formatting found in the destination range. • Transpose – It changes the orientation of the copies range. In this option, the rows become columns and vice versa.